Wednesday morning Judy and I took the water taxi from Port Oleans - Riverside to Downtown Disney. 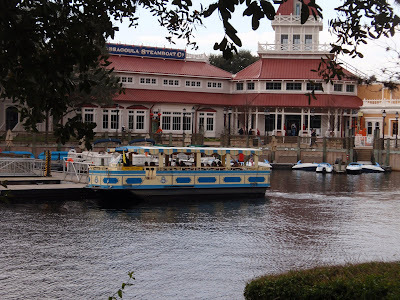 Downtown Disney is divided into three sections - all located along the waterfront. Downtown Disney West Side showcases top-notch restaurants, a 24-screen AMC Pleasure Island movie theater, and other uncommon shops. Here you'll also find the exquisite Cirque du Soleil La Nouba live entertainment show and the DisneyQuest Indoor Interactive theme park. Cirque was wonderful! 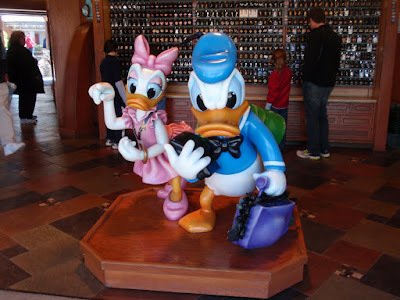 Downtown Disney Marketplace provides an appealing area to take a break from Disney Theme Parks and Water Parks—especially if you're in search of Disney merchandise. Here is the largest Disney character store in the world. 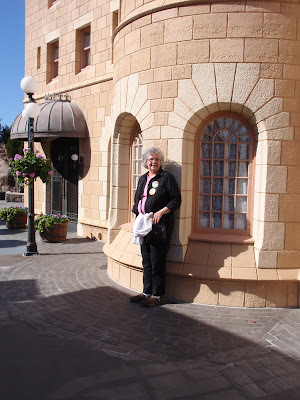 Judy had a good time looking at the pethora of Disney offerings. 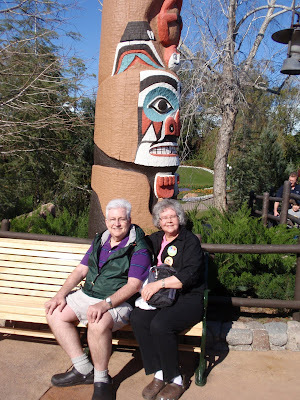 We bought gifts for the grandkids and big kids in this area. 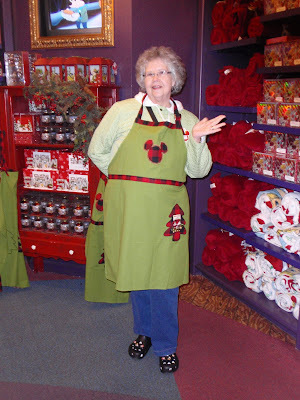 The good wife could not resist the Mickey Christmas apron. There were many restaurants that I wish we had access to here in the mountain state. 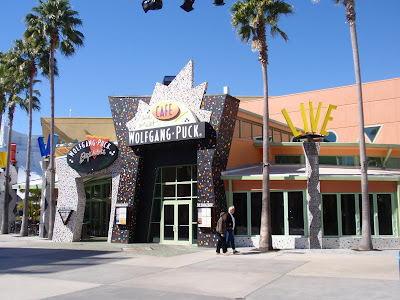 I love Wolfgang Puck's. My favorite in that restarant has to be the smoked salmon pizza!! Alas, we had lunch/dinner reservations so we had to pass that opportunity. I wondered why Donald was so angry looking? Could it be that he had to carry all that Daisy has purchased. 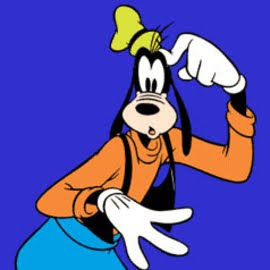 Guess he did not know about the Disney delivery system. When buying merchandise, one can opt to have it delivered to your resort without any extra fees. Nice! Then you pick up your purchases at your own resort store and realize that you could have bought the same stuff there!! 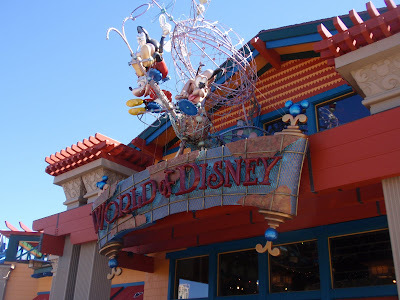 Downtown Disney is such a colorful area with many specialized stores. 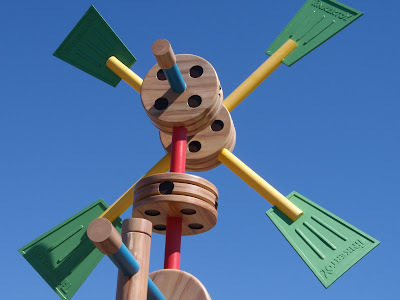 Love this huge tinkertoy sculpture. 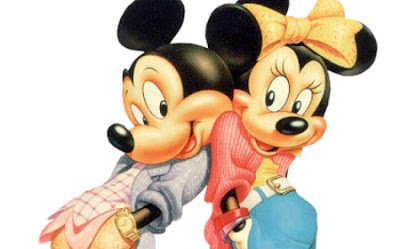 Donald and Daisy may not have looked cheerful, but Mickey and Minnie seem to be extremely happy. It must be the tourists who are posing behind them! 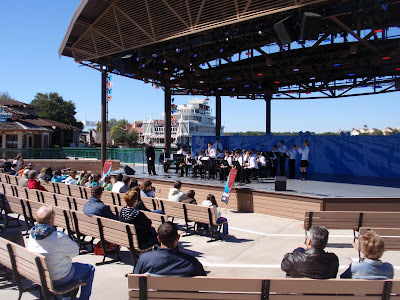 There is a large amphitheater on the waterfront designed to showcase performing groups from across the country. The World Of Disney Store in Downtown Disney Marketplace is the largest Disney character store in Walt Disney World Resort—and on Earth! We did not go in this time. One has to always leave something to see next time! 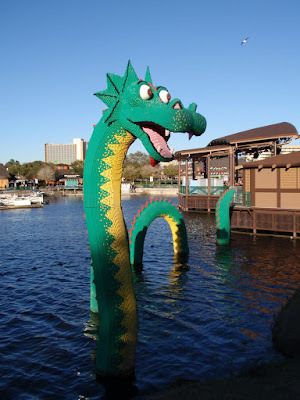 As we were walking toward Pleasure Island, we came across the strange creature below. Can you guess what material is used to construct it? The answer will be in tomorrow's blog. We'll finish our excursion today. 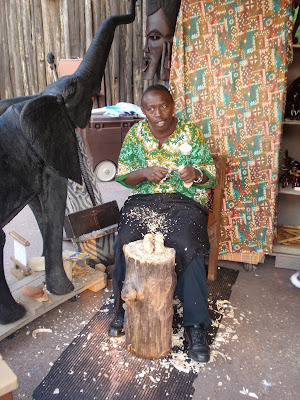 You can see, as we arrived, in Epcot the Disney characters were out for the kids and the craftmen from Africa were busy carving walking sticks and wooden sculptures. Of all the international showcases, the three that really were exceptional to us were the Mexico, China, and Germany. Below is the entrance to Mexico. This pavilion was so happy. Live music was provided by the gentlemen shown below who were excellent. 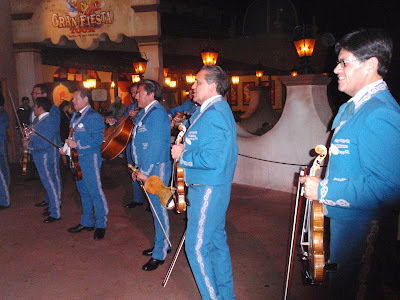 Notice in the background the boat ride called the Gran Fiesta Tour - that attraction begins with posters indicating that the Three Caballeros are to perform a concert tonight. After boarding the boat, Judy and I floated around a Mayan pyramid as soft music and animal sounds were heard in the distance. 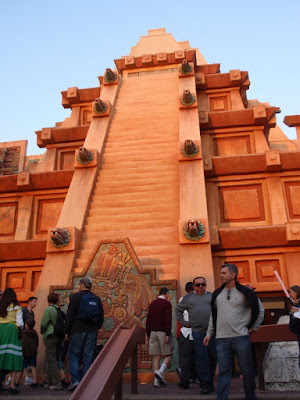 Soon, we entered a tunnel on the side of the pyramid, where Panchito Pistoles and José Carioca of The Three Caballeros introduce themselves, only to find out that Donald Duck, the third member of the group, had run off, prompting Panchito and Jose to set off on a frantic search for their missing friend. The next few scenes showed Donald touring Mexico and José and Panchito on a magic sarape (a sort of Mexican flying poncho) looking for him. 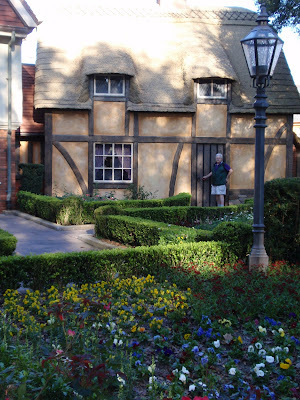 The next scene had characters similar to 'It's a Small World' with dancing animatronics and a Donald Duck piñata. Once past this area, we entered a cave, which featured different scenes of live-action footage with the Caballeros. After leaving the cave, there were three panels featuring a Mariachi band in the first, some Mexican girls and Donald in the second, and Panchito and José pulling Donald away from the girls in the third. 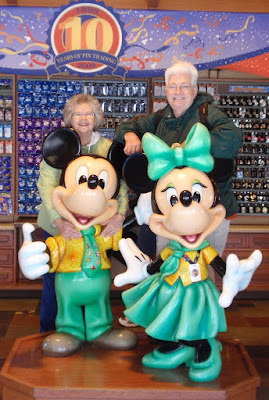 From here, Judy and I floated into Mexico City, where fireworks were going off overhead and the Three Caballeros were finally performing their concert. Man, I look studly in this hat! Really wanted one, but could not figure out how to get it home on the plane. We ate lunch in the Mexican Restaurant called the San Angel Inn which overlooked an indoor lagoon. The beef tacos were exceptional. 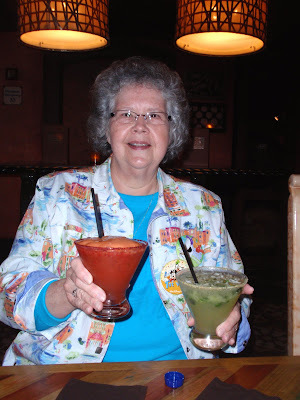 Speaking of exceptional, Judy and I had to wait about 20 minutes before being seated for lunch, so we decided to check out the margaritas at La Cava del Tequila, a tequila bar with a vast collection of tequilas, specialty margaritas and light Mexican appetizers. We had an appetizer and the greatest margaritas we have ever experienced. Judy had the blood orange margarita and I enjoyed the cucumber margarita. Norway is the next showcase after Mexico (going clockwise around the International Lagoon). 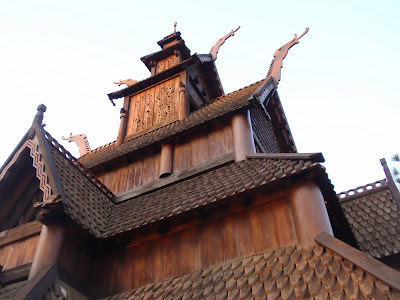 The Norway experience has a stave church constructed on the site. The Norway folks have a ride called the Maelstrom. As you know a maelstrom is a very powerful whirlpool; a large, swirling body of water. 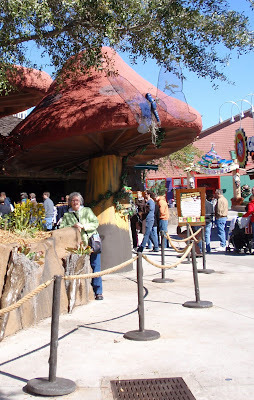 Visitors board Viking boats and travel through various scenes, culminating with a backwards drop down a small slope. 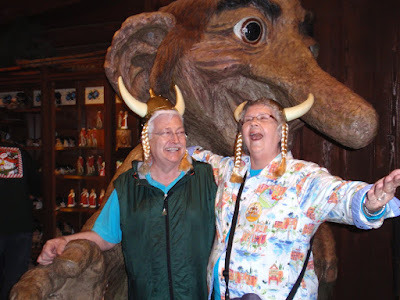 Judy and I had to celebrate under the nose of the giant troll. Don't called me Jim - I answer to Helga! 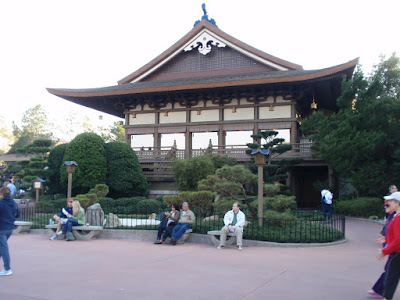 The Chinese pavilion below is so beautiful. 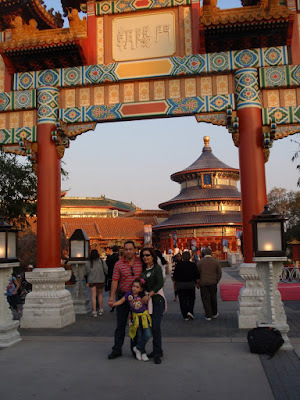 The Chinese have done such a fine job in presenting their culture and heritage. The pavilion had reproductions of a few of the more than 6,000 terra cotta warriors that comprised a "Spirit Army" that protected the tomb of Emperor Qin Shi Huang, first Emperor of the Qin Dynasty. We saw a large display of the real artifacts in a Baltimore musem several years ago. 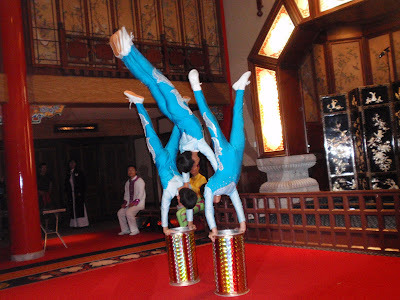 We were so impressed with the Chinese acrobats. These young lads were fantastic. This gal was wonderful in balance and foot manipulations. 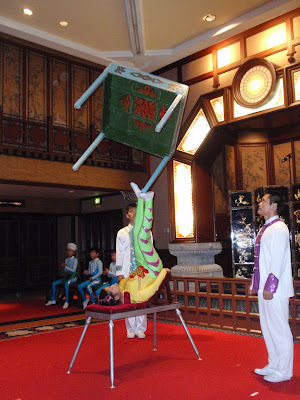 Pots, chairs, and even tables were juggled expertly. 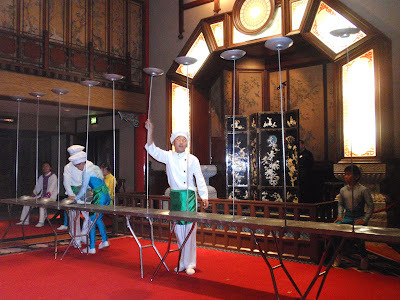 The performance ended with plate spinning. It was a very neat experience for us. I would have loved to eat in the Chinese pavilion, but we had reservations in the magnificent German restaurant - the Biergarten. 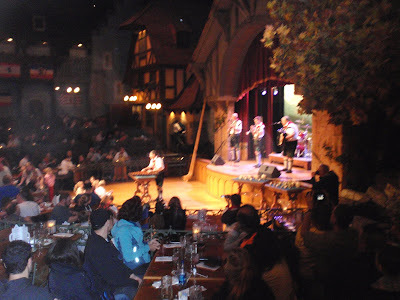 At the Biergarten Restaurant, seating is at long communal tables and we were offered a great view of the festivities. 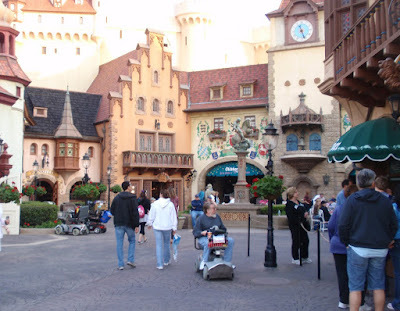 Our dinner selections consisted of hearty German favorites such as bratwurst, red cabbage, pork schnitzel and spaetzle. Delicious desserts, from Bavarian cheesecake to freshly baked apple strudel completed our meal. This was another great meal at Disney World! We had another great day at Walt Disney world. 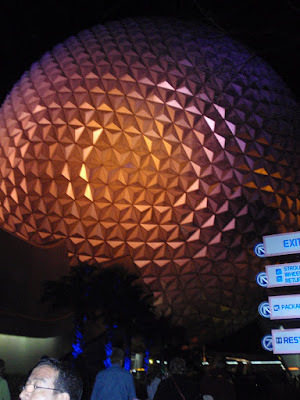 We left Epcot at 9 P.M. with full bellies and plenty of memories. Tomorrow - Wednesday at Downtown Disney! 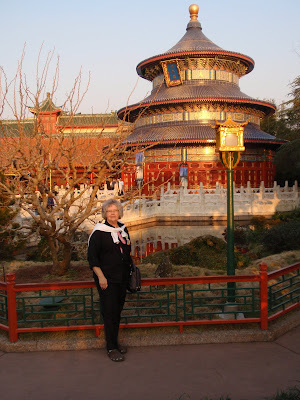 After Judy returned from her "lost" adventure, we had breakfast and arrived once again at Epcot. 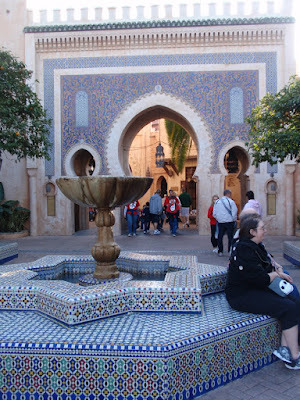 We started walking around The World Showcase. Let me give you a brief description of each of the countries represented. Judy and I started in Canada. Who should be here posing with kids? 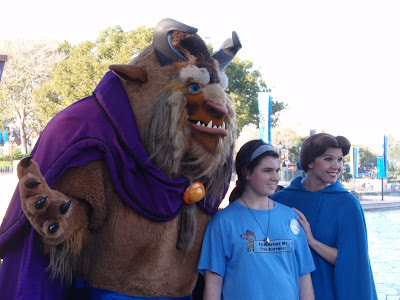 Why it is Belle and the Beast! As we walked through Morocco, Japan came into view. 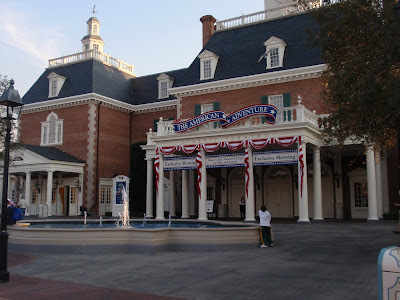 The American Adventure is the United States of America's venue. We were not able to see the film and exhibits because the pavillion had just closed. A light rain started in the afternoon but did not stop us from seeing what we wanted to see. Judy and I came upon another photo oportunity for the kids. 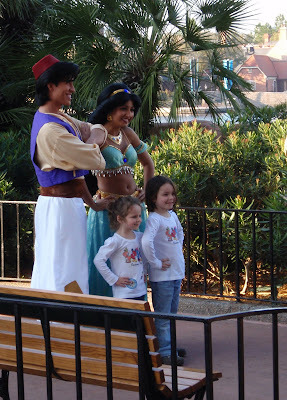 Here were Disney's Aladdin and Princess Jasmine! Italy, Germany, China, Norway, and Mexico were our favorites. 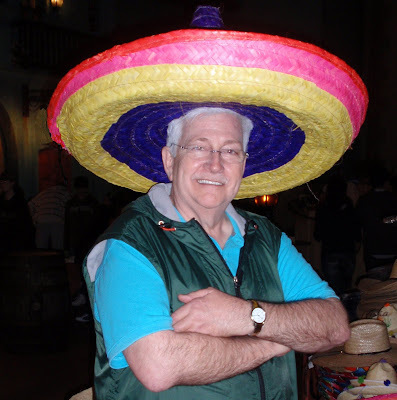 We ate lunch in Mexico (will cover that in tomorrow's blog) and dinner at the Biergarten Restaurant in Germany. 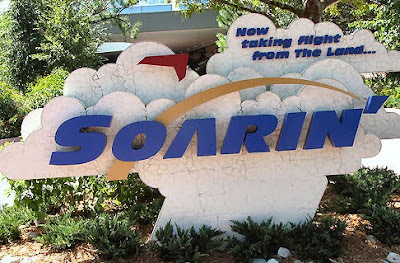 We had 3:00 PM fast passes for the new adventure entitled Soarin. 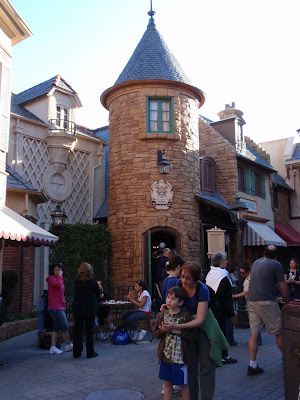 That ride is located in the Pavilion of the Land. 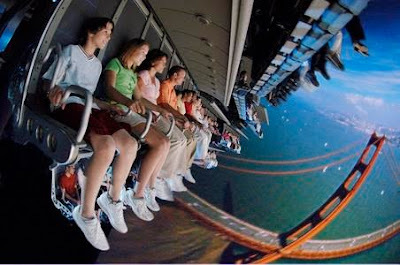 Soarin' is a multi-sensory attraction that simulates a peaceful hang-gliding flight over the Golden State of California. 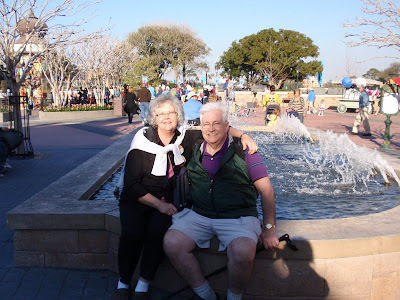 Once Judy and I fastened our seat belts on the multi-passenger glider, we were lifted 40 feet into the air. We swooped up and soared towards the clouds and spectacular California panoramas. An IMAX projection dome wraps 180 degrees around you, so we were engulfed by the impressive scenery. 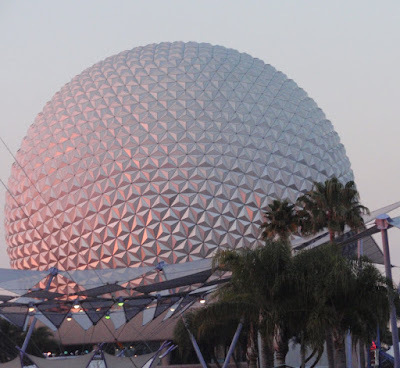 Tomorrow - The Conclusion of Epcot. Tuesday morning was another beautiful morning. I was ready to go to breakfast, but Miss Judy had a few tasks to accomplish before leaving our room. 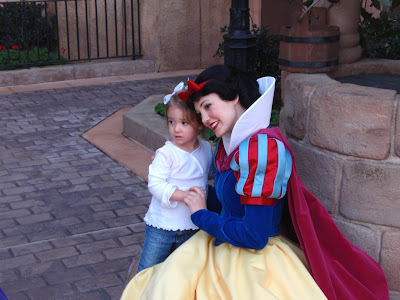 I asked if I could go and meet her in the lobby where we would eat and then leave for another day at Epcot. She said that will be fine. Off I went with the ole camera to take some photos on the way to the food court. That was around 10 AM. Forty-five minutes later, I started to worry about the good lady. I went outside and sat in the patio area so I could keep my eye on the bridge that she had to cross in order to come into the food court Now, Miss Judy has been late before so this time period was not too unusual. An hour had now passed, and I decided it was time to trek the path back to the room. As I crossed the bridge, the cell phone rang! Now I am concerned. The operator said that I had a collect call from - "Judy Meads". The operator told me I had two minutes in whic hI had to punch in my Visa card number or Judy would be lost in cyberspace forever. My heart was now pounding faster. I quickly found my wallet, placed it on a hedge beside the walkway, and withdrew my credit card. Quickly I entered the appropriate numbers. Hurray, my Judy answered. My questions were calm and matter of fact - "WHERE ARE YOU? ARE YOU IN AN EMERGENCY ROOM? DID YOU CALL 911? ARE YOU OK?" Judy assured me that she was fine and was now in the lobby. I wondered how in the world could she be in the lobby when my eagle eye was locked on the bridge leading from our room! ANSWER! It seems that Judy left the room and, instead of going south to the food court area, she walked north. 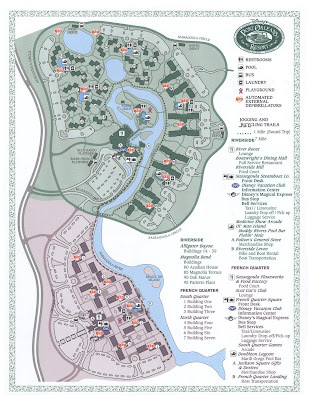 You have to realize that this resort is large with many - perhaps 50 -- units in Alligator Bayou of Port Orleans - Riverside with units that all look the same. 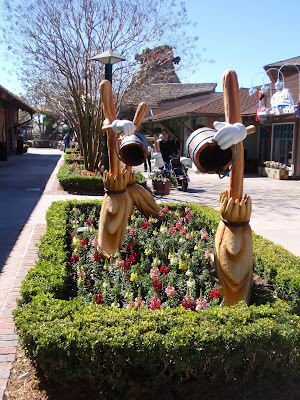 Please click on the map below for an enlargement of Port Orleans - Riverside. Notice where our building is located (#39) - toward the north on the map. I was waiting south at the marina area. THE REST OF THE STORY! Miss Judy finally went through a hedge in a parking lot where she saw only one car. She approached the vehicle and asked the driver directions to the lobby. I am certain that by that time she was red faced and puffing like a mountain climber who had taken the wrong path up Mt. Everest. "No trouble!" he said. Judy noticed the beautiful children in the car. They immediately climbed into the third seat of the van so Judy could sit in the backseat. The doctor was also standing outside the car holding the back door open saying, "Please! I insist!" he said with a smile. Three pairs of dark brown eyes and huge sparkling smiles were on the faces of the children as if their Fairy Grandmother had just arrived. (Judy is thinking - I am getting in a car with strangers. My Mom would be horrified!) The family spoke Spanish and a little English and were from South America. They graciously took her to the resort's lobby. I quickly met my love and she related her story. Hurray! All was well. 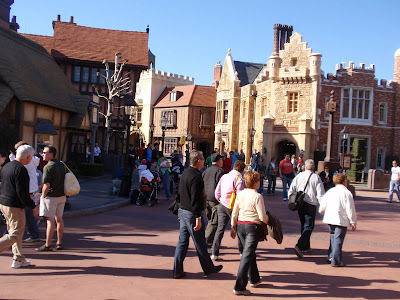 Tomorrow- We finally arrive for day two at Epcot! After having dinner at The Coral Reef restaurant, we walked back to the World Showcase Lagoon to get ready for IllumiNations. The barge above houses a metal earth that serves as the centerpiece for the fireworks extravaganza - IllumiNations: Reflections of Earth. 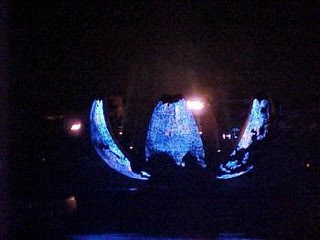 Featuring breathtaking fireworks, brilliant bursts of fire, laserlight effects, dramatic fountain barges, a stirring musical score and the world's first spherical video display system—the 350,0000-pound Earth Globe—IllumiNations: Reflections of Earth is an inspirational nighttime spectacular. 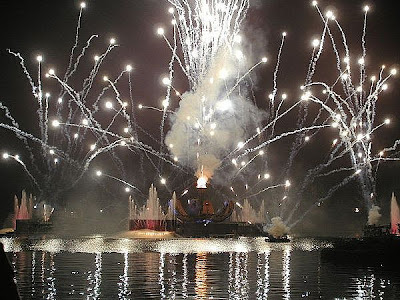 Just before 9 PM the flames ignite around The World Showcase Lagoon. 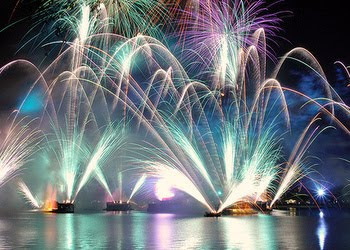 IllumiNations: Reflections of Earth at Epcot tells the story of our planet in three unforgettable acts. Act 1: Chaos — Bear witness to the explosion at the dawn of time that brings about the creation of Earth, where you are invited to observe the Inferno Barge, a liquid-propane mechanism launching balls of fire 60 feet into the air. 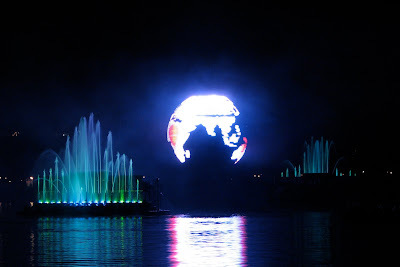 Act 2: Order — Behold the glowing Earth Globe as it glides peacefully to the center of the lagoon, illuminated with—and celebrating—the famous faces and achievements of our time. Act 3: Meaning — During this final act, the Earth Globe blossoms to reveal a torch and the glow of a thousand fireworks and laserlights that fill the night sky in a shimmering kaleidoscope of color and sound, propelling us into the future. This was a most inspiring program. We crawled into our beds around 10:30 PM with many wonderful images of the events of the day.